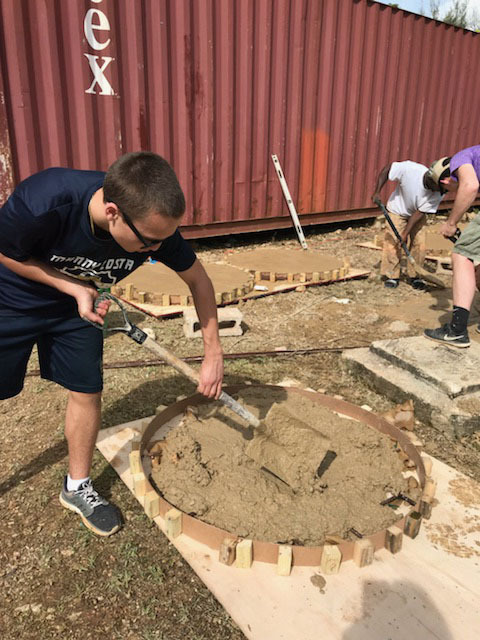 Malden Catholic's second international Mission Service Trip to Montego Bay, Jamaica took place from January 6-13, 2018. 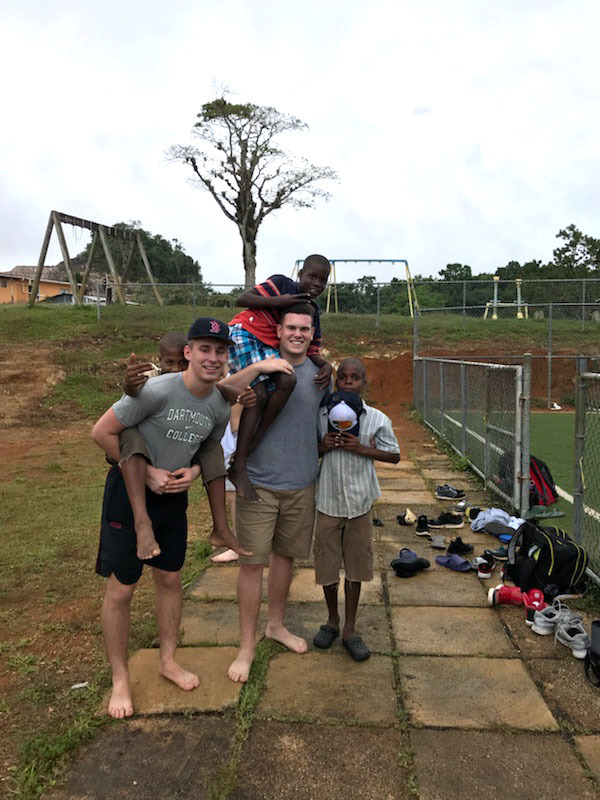 Over the course of the week, 20 Malden Catholic students served the poorest of the poor in rural Jamaica. Some of our projects included refurbishing Mizpah’s Library, revamping the exterior of the primary school, painting the exterior with a mural, beautifying the building and playground with additional painting and flowers, and providing 1:1 support within the classroom to help students requiring additional support. We are very grateful to our administrators and the students' parents for their support and encouragement in planning this trip and making it possible. Please feel free to read about our journey through the blog below! Today wasn’t an ordinary day in Jamaica, hanging and playing with the kids at the boys' home. Our day started bright and early for breakfast where we ate a traditional Jamaican dish of egg, dumplings, plantains and sea-salt fish. After eating, we were told we would be farming for the day, so we had to wear long sleeves and pants to protect ourselves from plants with thorns and mosquitoes. We walked to the farm at 9:00 a.m. and were amazed at the amount of farming we were expected to help the farmer do. We were separated into two groups: one planting seeds and the other clearing the field of tomato plants that had been harvested. Nine other guys and I helped our farmer, Oshane, with his hundreds of rows of tomato plants. We pulled out the plants and removed the long wooden sticks that were used to hold them up as they grew. First, we had to cut the string holding the plants, which had grown to about three feet, and tie it to the sticks which kept the plants upright. At the end of the day, Oshane told us it would have taken him 4-5 days to complete the job. Or it would have cost him 20,000 Jamaican dollars to pay someone to hire do the work. We also learned he starts his day at 5:00 a.m. and works until about 10:00. Then he attends college using the money from his farm to pay for the tuition. When he returns, he goes back to do more farm work. Six hours later, we completed our time on the ￼farm. What the boys and I really got out of the day was an appreciation and understanding of the circumstances Jamaicans face everyday. They have a passion for farming and we should bring that passion into our everyday lives. Sometimes we look at school as a drag but for them it is a blessing. During our time in Jamaica we have been happy to help in any way possible. Today it just happened that we helped a young farmer trying to make a living off his tomato plants. Today was by far one of the most difficult days of my entire life. As I am writing this reflection, it is a gloomy and rainy day which is how I am currently feeling. Despite being sad and shedding a few tears, I look back at today and it would easily qualify as a great day in my book. The group of Malden Catholic Jamaica Volunteers woke up to a plate of pancakes with an excellent fruit platter. After filling up and feeling satisfied with the excellent breakfast, we headed to the Mizpah Primary School for the last time. I was assigned to a group that was tasked with constructing the project. While other volunteers - Jason, Anthony , and Dennis - spent time in classrooms to work with children, other coached basketball. It was lunchtime when it started to rain. I was sent from doing construction into a fifth grade classroom, I went with the fifth graders and their teacher to the guidance office. There we talked about setting goals for the New Year and prioritizing. When the students finished the assignment, the principal, Ms. Murray called us to the basketball court where the kids performed for us and thanked us for all we did for her students, the children sang and danced for us and then it was time to say our goodbyes. It was very difficult for us to leave the children but we left with many good memories. Tomorrow we will go one last time to take photos of completed project we did with the school. We will also be working on a local farm. The children of Mizpah Primary School were anxiously awaiting our arrival today. Yesterday, the teachers told the boys and girls that if they completed their homework, MC would return today. The principal was happy to tell us that 100% of the children had completed their work! The boys and girls could not wait to show us their stickers. Plus Ultra, Mizpah! We were also invited to teach the physical education class for the day. Children in grades 1-6 were instructed in the game of basketball and it wasn’t too long before we heard the sound of basketballs bouncing, children laughing and cheers when someone scored for the first time. Everyone had great fun and gave their new coaches hugs and high fives. When we served at Mizpah last year, we saw that the children’s classrooms were small and crowded. Jamaica Volunteers 2018 decided that for this year’s project we would like to provide some outdoor space so the children could read a book or eat lunch while enjoying the beautiful Jamaica weather. 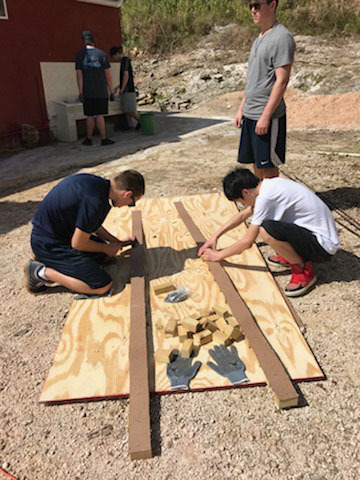 So, work on our construction project continued today, and we were able to make 10 cement benches to go with the five round tables we made yesterday. Before the cement was able to dry, MC left its mark as the boys wrote Malden Catholic and their names on the bottom of the benches. We look forward to returning to the school to work another day and see the smiling faces of our new little friends. January 10, 2017, 11:07 a.m.
** UPDATE: MC’s Administration has been in touch with Mr. Michael Driscoll '06 regarding any impact on Jamaica from last night’s earthquake in the Caribbean off the coast of Honduras. Mr. Driscoll reports that the group is located inland and there has been no impact on the MC group and all is fine. According to the National Weather Service, there is no tsunami threat at this time. Spirits were high in anticipation of beginning this year’s project for Mizpah Elementary School. Campus Minister divided the boys into groups- one group volunteered to teach the game of basketball in their physical education classes, while another group despised of old desks, tables and random debris off the top of a flat roof. The third group went to work with the children’s in their classroom and the last group began the work on playground. Tomorrow all groups will shift so each gets to experience all types of service. The playground is coming along the boys cut metal, sawed wood, and mixed cement. By the time we left they had made five round cement table tops for the children to use in their new playground.Tomorrow’s group will make the table based and began work on the cement benches. At 3:00 we got back on the bus to travel back to the boys home to play with young friends. So we went to a local market to buy some snacks- most chips, cookies - good old American standbys! Although our meals have been amazing and we have enjoyed traditional Jamaican cuisine prepared by the wonderful people at mission house the boys longed for a bag of junk food. After a great day of service we decided to give the boys a treat- before returning to the house we ventured out to a local market to let them buy some snacks. Each night before going to bed for the night, the boys are given questions to reflect upon in their journals. Wonderful sharing and discussion followed and we ended the night in prayer. The first full day of our mission journey began today as we gathered at Mt. Olivet Church. We were welcomed with open arms by the parishioners and our boys sang, prayed and were inspired by the spirit of the Jamaican people. After lunch we journey out to explore the 25 acres of land that surround Tan Y Bryn the Mission house where we are staying. The high point of the day for everyone was our visit to the Boys Home. Many of the children remembered us from last year and came running out to meet us. Soon there were groups of MC men playing soccer, basketball and football with the children. The time went by so quickly and the bus came to pick us up, but the children gathered around us not wanting their new friends to leave. Mr Driscoll got off the bus and promised we would return tomorrow. On the bus ride home many of our young men wanted to know if it was possible for them to return next year - 24 hours and they have already fallen in love with the Jamaica people and the service of God. Tomorrow we go to Mizpah School and we can’t wait to continue the journey.